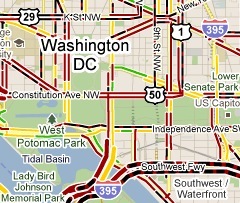 It’s a pretty ugly evening out there for traffic. Worse, the bus system is apparently overwhelmed, judging by the pictures we’re seeing on Twitter for the bus bay at West Falls Church Metro. Metro got caught flatfooted by the storm, and hadn’t moved the bus schedule up to match the early release from OPM. Looking at Google Maps, though, the roads aren’t any better. 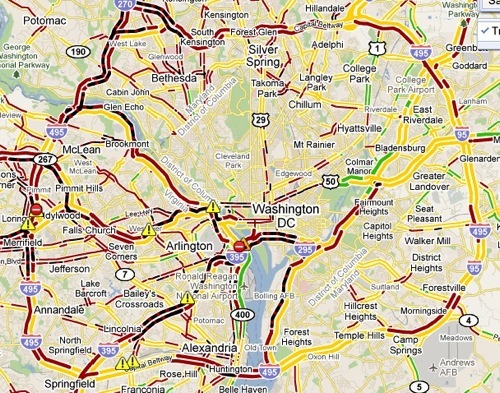 There’s a whole lot of extra red and black on the roads, so go slow, turn on your goddamned headlights, and drive carefully. Full map after the cut. My guess is that part of the reason WFC is so crowded is that PRTC buses are running their emergency service plan – meaning all the people they normally pick up in DC to bring home to Manassas now have to go to WFC to catch a bus.